This article is about red blood cell stacks. "Rouleaux" is a plural form for "Rouleau". For people, see Rouleau (surname). For other uses, see Rouleau. Rouleaux formation in a peripheral blood smear from a patient with plasma cell myeloma. 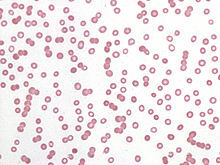 Rouleaux (singular is rouleau) are stacks or aggregations of red blood cells (RBCs) which form because of the unique discoid shape of the cells in vertebrates. The flat surface of the discoid RBCs gives them a large surface area to make contact with and stick to each other; thus forming a rouleau. They occur when the plasma protein concentration is high, and because of them the ESR (erythrocyte sedimentation rate) is also increased. This is a non-specific indicator of the presence of disease. Conversely the presence of Rouleaux is a cause of disease because it will restrict the flow of blood throughout the body because capillaries can only accept free flowing singular and independent red blood cells. The aggregations also known as "clumping" form as an allergic reaction to certain antibiotics and not necessarily because of disease. Conditions which cause rouleaux formation include infections, multiple myeloma, Waldenstrom's macroglobulinemia, inflammatory and connective tissue disorders, and cancers. It also occurs in diabetes mellitus and is one of the causative factors for microvascular occlusion in diabetic retinopathy. Acute-phase proteins, particularly fibrinogen, interact with sialic acid on the surface of RBCs to facilitate the formation of rouleaux. An increase in the ratio of RBCs to plasma volume, as seen in the setting of polycythemia and hypovolemia, increases rouleaux formation and accelerates sedimentation. Rouleaux formation is retarded by albumin proteins. Rouleaux formations are also adopted by spermatozoa as a means of cooperation between genetically similar gametocytes so as to improve reproductive success through enhanced motility and, therefore, fertilization capacity—e.g., the guinea pig. Typical mammalian erythrocytes: (a) seen from surface; (b) in profile, forming rouleaux. According to Smoluchowski aggregation, the kinetics of colloids is based on the assumption that each particle is surrounded by a "sphere influence". Single spherical particles which undergo Brownian motion collide and sticking of particles happens. As aggregation proceeds, the average diffusion constant of the aggregate population decreases. The aggregation of red blood cells progresses in the same manner except that cells are biconcave rather than spherical. Wikimedia Commons has media related to Rouleaux. Stoltz, J.F. ; Gaillard, S.; Paulus, F.; Henri, O.; Dixneuf, P.; Stoltz, J.F. ; Puchelle, E. (1 December 1984). "Experimental approach to rouleau formation. Comparison of three methods". Biorheology. 23 (s1): 221–226. doi:10.3233/BIR-1984-23S138. Huang, C.R. ; Pan, W.D. ; Chen, H.Q. ; Copley, A.L. (1 December 1987). "Thixotropic properties of whole blood from healthy human subjects". Biorheology. 24 (6): 795–801. doi:10.3233/BIR-1987-24630. PMID 3502773. Samsel, R.W. ; Perelson, A.S. (February 1982). "Kinetics of rouleau formation. I. A mass action approach with geometric features". Biophysical Journal. 37 (2): 493–514. Bibcode:1982BpJ....37..493S. doi:10.1016/S0006-3495(82)84696-1. PMC 1328832. PMID 7059652. Samsel, R.W. ; Perelson, A.S. (April 1984). "Kinetics of rouleau formation. II. Reversible reactions". Biophysical Journal. 45 (4): 805–824. Bibcode:1984BpJ....45..805S. doi:10.1016/S0006-3495(84)84225-3. PMC 1434900. PMID 6426540. Fabry, T. L. (1 November 1987). "Mechanism of erythrocyte aggregation and sedimentation". Blood. 70 (5): 1572–1576. PMID 3663946. Barshtein, G.; Wajnblum, D.; Yedgar, S. (May 2000). "Kinetics of Linear Rouleaux Formation Studied by Visual Monitoring of Red Cell Dynamic Organization". Biophysical Journal. 78 (5): 2470–2474. Bibcode:2000BpJ....78.2470B. doi:10.1016/S0006-3495(00)76791-9. PMC 1300836. PMID 10777743.